Want a secluded private hide-away for the weekend? Need a large roomy house during your vacation? Click a region above or just scroll down to see your Choices. 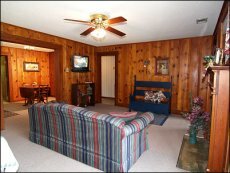 A 3 bedroom 2 bath vacation home with a good view of the White River, Ashley's is located 8 miles downstream from Bull Shoals dam at Sportman's hole. A top-notch entertainment system with DVD, video, CD changer, and satellite TV with 100's of channels, a fully equipped kitchen, screened porch and deck with a river view, washer/dryer, and all new furniture. A roomy, non-smoking bright facility on the White River. Private, peaceful, secluded. Right on the river with lots of wildlife, wildflowers, walking trails. Located on the Marion County side of the White River in the Ranchettes. Private wade and boat fishing access. This is a separate house available by the night. Fishing guides available. Denton Ferry Luxury Cabin . . .
Is not the traditional Ozarks cabin! There is private White River wade-in access. This 2 bedroom 3 bath 1,700 sq.ft. home sleeps 8. Enjoy King beds, jetted tubs, open beam ceiling, 55" color Satellite TV, Bose Sound, and a gas fireplace. It has a 1,200 sq ft. deck with gas BBQ and dining area. Close to attractions and shopping and remote enough to relax and enjoy. Experience the White River and Ozarks in true Luxury. The location trout fishermen seek - Right at the Wild Cat Shoals access. A convenient location to meet your guide, to launch your own boat, or even to fish from the bank. Good restaurants and Mountain Home 15 minutes away. 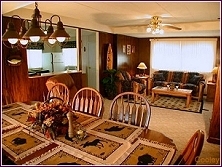 With 3 bathrooms and 7 beds White River Getaway is ideal for a group. All new appliances and furniture. Full kitchen, deck, lawn, and plenty of parking. If seclusion is what you seek, this is it! Settled in the bottom of an Ozark creek valley, in the middle of 80 acres, this cozy log cabin is next to a year around creek. It is 3/4 mi from the North Fork River, and 4 miles from Lake Norfork. Very quiet and secluded, yet not remote. The village of Norfork is 10 minutes away, Mountain Home is 20 minutes away. The Cove Vacation Lake Homes - Our two, beautiful, lakeview homes offer more room and more privacy than ordinary cottages. Located in a groomed valley on 20 secluded acres. The 4 bedroom, 2 1/2 bath home has a private pool and game room. The 2 bedroom, 2 bath has a wrap around deck. Relax on your fan lit deck or take an easy stroll down to the lake. Luxury has never been so affordable! Right on the water, this vacation home has large lakeview decks where you'll enjoy sunsets over the water. Inside are three bedrooms, 2 baths, full kitchen, and a vaulted greatroom with large lakeview windows and a woodburning fire place. Walk to the marina to rent boats, wave runners. Very short walk to public swimming, public lakeside park. Two secluded homes - A 3 bedroom 2 bath on 6 acres, and a 2-plus bedroom 1 bath on 5 acres. Both have fireplaces, one has lake views, the other Ozark hill views. Both come with full access to the boat dock, swimming pool, and all other resort amenities. Wildlife feeds in the meadows surrounding each house. Several restaurants are within a 10 minute drive of each unit. © Copyright 1999 to the present by the Ozark Mountains Website, Inc. (OMW) DBA 2Cooleys.Com. All rights reserved. No part of this presentation maybe used without written permission from Ozark Mountains Website, Inc. Certain images used by permission.